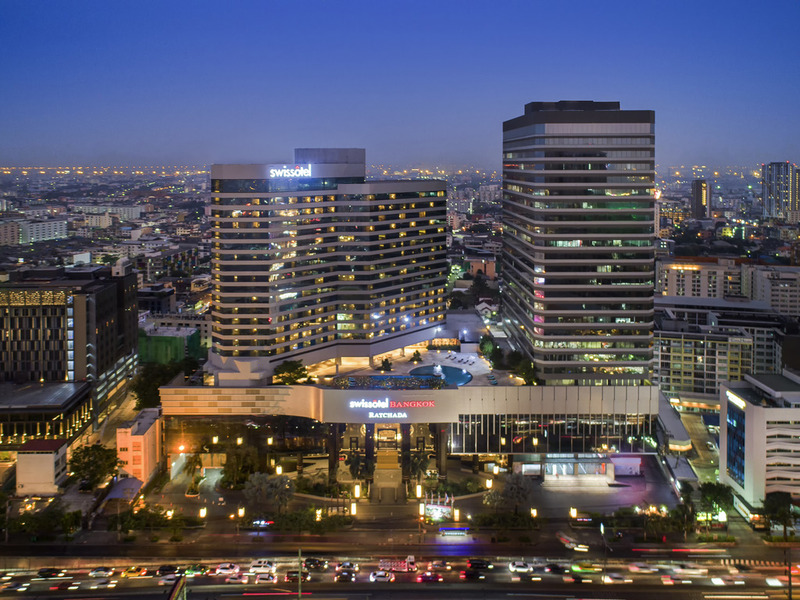 The Swissotel Bangkok Ratchada is located on Ratchadapisek Road, Bangkok's new thriving business and entertainment district and is just about 25 minutes drive away from the Suvarnabhumi International Airport via the expressway and motorway. The 22-stor ey hotel houses 407 spacious and elegantly-appointed rooms as well as suiteswith non-smoking floors and wheelchair accessible rooms with friendly features for the guests with disability. The executive club lounge opens its doors exclusively to you. With buffet breakfast, international newspapers and complimentary WIFI, take time to enjoy the rooftop city views, check your emails and catch up on current affairs. Takumi, meaning skillful and clever, is a spirited contemporary Japanese restaurant. Takumi expresses a new movement in Japanese cuisine and reflects the transition of seasons, capturing the virtues of freshness, simplicity, beauty and health. Experience a cultural culinary experience in Thai, Asian, and European foods. 204 Bistro offers a wide variety of dishes, Salad bar, Seafood and Teppanyaki. After a delightful meal, enjoy homemade Cakes, Ice-cream and various kinds of fruits. 204 Bar offers a comfortable hotel bar equipped with classic cocktails and special mixologist's concoctions paired with great snacks and savories, and current beats. 204 Bar is a stylish gathering place offering cocktails and snacks with live entertainment. I was disappointed that there is no ironing board in the rooms. Also do consider using wooden chairs at the swimming pool rather than the cushion ones as it is more hygienic. Room was clean, everything worked and the staff were friendly and attentive. Had a most enjoyable stay! I had another great experience. Only two improvement suggestions. 1. Please have decaf coffee available in the rooms. 2. Please offer take away coffee in the executive lounge. Just a short stayed for my meeting in Bangkok before left for early morning flight. Thank for warming welcome from Khun M - front office and the team at club lounge. The room was comfy with perfect prepare of house keeping team and hotel facilites also good. I just comment about the breakfast box that i ordered for early checking out on morning. It was so poor with limit food, so i never saw with another hotel that i ordered before. I had one night stay at Swissotel, not too much but a great experience, cozy, clean and the staff extremely polite. I'll be back soon, thanks! Room was spacious. Hotel is right next to the MRT station. Staff was friendly and welcoming. Staff were knowledgeable, courteous and vert attentive to all of my needs. The facilities were perfect for my stay. Room was spacious and clean. Breakfast was delicious. Staffs are very nice and friendly. Overall very pleased. I found breakfast change less for choice as before. Very good service. When check-in, I was upgraded to larger room. Check out time could be shorter.